Safcol Brisling Sardines are a great source of Omega-3 fatty acids. 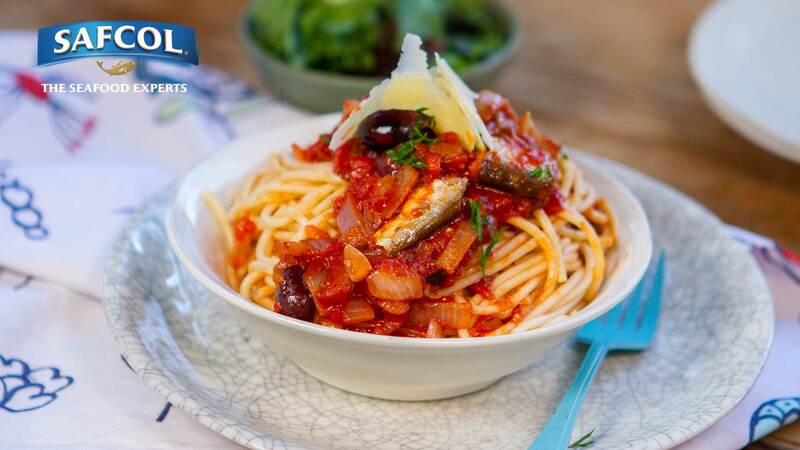 Adding them to this simple sardine puttanesca spaghetti is a great and very affordable way to get extra protein into your diet. This delicious and easy to make meal will feed the family without breaking the bank. Cook the pasta following the pack instructions for ‘al dente’. While the pasta cooks, in a medium frying pan on a medium heat, add the onion and 2 tablespoons of the olive oil, stirring occasionally while you fry until soft and just turning colour. Add the garlic, cooking for about 30 seconds until it smells fragrant. Stir in the chilli, anchovy fillets (if you’re using them), crushed tomatoes, lemon rind and sugar. Cook, stirring occasionally until the tomato liquid has almost totally reduced. Stir in the parsley leaves, Safcol Brisling Sardines and olives. Season generously with salt & pepper, then remove from the heat. Once the pasta is cooked and drained, toss through the remaining olive oil and then the sardine puttanesca sauce.